Every budget introduced in the Parliament ushers in plenty of hopes and promises but the record of achievements have always fallen short of initial promises. This has been the sad history of Sri Lankan Government budgets, at least until the demise of its most successful FinanceMinister and budget critique, Dr. N.M. Perera. 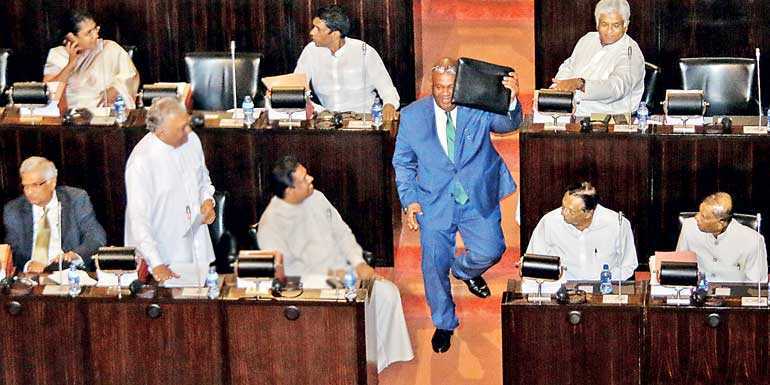 Minister Mangala Samaraweera’s 2019-20 Budget will not be an exception to this historic reality. No one in the Parliament keeps track of the record of a budget’s achievements or holds the minister concerned accountable until the next budget is introduced. Captioned “Enterprise Sri Lanka – Empowering People and Nurturing the Poor” with added resolve to “shift from a culture of hand-outs to a culture of empowerment and independence”,it ison the face of ita carefully drawn exercise in balancing the demands between international and institutional lenders – especially the IMF on one hand, and on the othertherestless massescrying for relief from mounting economic pressures, especially the cost of living. Given the prevailing economic scenario of worsening trade and budget deficits, depreciating currency, interest burden on inheritance and current debt, with an inescapable need to fall into more debt, as well as falling resource productivity, all at a time when the nation is about to go to the polls at least twice if not thrice this year, the FinanceMinisterfrom a government on life supportis bold enough not to make his Budget either emphatically growth-focused or benevolently distribution-oriented. In that sense, it is a balanced budget. However, how much of the Budget is achievable is a daunting question to answer. The Minister said that this Budget was the “continuation of the thrust” of his previous Budget, but he forgot to tell us how much of the previous Budget was achieved, at least until the infamous October crisis. It is unfair to make the President a whipping boy for all the failures of the Government. Achievement deficit, like several other deficits in the country, is a perennial problem of National Budgets in our blessed land. The strength of any budget should be measured not by its aspirations and accounting techniques but by its plan of implementation. How is this Budget going to be implemented given the facts: (a) arunning war between the Prime Minister and President, in which the latter has determined to sabotage the Government, (b) at least one part of the country and its population feelingignored and frustrated because of the Government’s lacklustre response to itspre- and post- war grievances, (c)the reign of rampant corruption and unchecked finance scandals, and (d) an incompetent public service. Even in a country without these problems there is a time lag between budgetary declarations and implementation because the bureaucracy takes time to process the Minister’s intentions and policies. In the context of Sri Lanka, even if the current Government were to come back after the next election, it is doubtful whether even 50% of the Minister’s policies and measures would have seen completion in practice.Administrative corruption and incompetency is the biggest challenge facing any government in this country. The Budget’s resolve to give incentives to the private sector by way of encouraging foreign direct investment, capital assistance to small and medium size enterprises, reforming educational curricula and teaching with a view to enhancing skills suited to modern economies, and measures to bring in more women into the workforce, are commendable aspirations. But they all depend on how the Government is going to tackle the fundamental issues mentioned above. Although a budget is an economic document, it has to be implemented within the ruling political and administrative climate. That climate can be either conducive to implementingthe budget fully,or indifferent if not adversarial, working to either slow down or halt its implementation. Given the overwhelminglypoliticisedpublic service and trade unions, andthe President’s open declaration to actually bring down the Government, full implementation of the budget proposals is not guaranteed. Facilities like capital assistance to small and medium size enterprises are also liable to be exploited by the corrupt and powerful unless there are strict guide lines for the selection of such enterprises. The rich and corrupt have ample ways of using Government concessions and facilities to enrich themselves. Even the FinanceMinister’s own Parliamentary colleagues are subject to influence by lobbyists and charlatans. At least in a couple of my previous contributions to this journal, I have insisted that what Sri Lanka needs is a technocratic Cabinet with an iron fist at the top. Meritocracy should rule public service and administrative malfeasance must be punished without fear or favour. To do that,the rule of law must prevail and the judiciary must be totally independent. This is a basic necessity to revolutionise our culture of governance which is subject to all types of pulls and pushes. Without meritocracy, bureaucratic competence, rule of law and independence of the judiciary,maladministration will ruin all economic plans or National Budgets, howeversound they are in theory and practice. Good governance is an absolute necessity to pull the economy out of its present rut. Managing an open economy is a complex task. Domestic upheavals can have international reverberations, as we witnessed in October last year, and international volatilities can have disastrous consequences to the domestic economy.To provide certainty at home is to win confidence abroad, and winning confidence abroad is to ensure profitability and progress at home. The best asset any country can have are its people. Without the co-operation of the people no government can translate its plans into action. That applies even to the Budget. Co-operation will come only if there is honesty and justice in governance. We are not ruled by robots and machines but by fellow humans. This is why we need rules and guidance to direct our behaviour. No amount of religious preaching and worshipping can guarantee good governance. Only rationally drawn out rules and regulations with a humane face and strict separation of powers under a democratic constitution can deliver good governance.It is the absence of this that will make MinisterSamaraweera’s Budgetan instrument to empower the rich and corrupt.